A central library in Niagara Falls, New York, survived a decade of water damage and related legal battles. But Paul Rudolph’s career was never the same. Water flows relentlessly up the Niagara River before crashing down into Niagara Falls, attracting millions of tourists from around the world every year. Two miles away, water nearly did in a public library before it opened, and an architect at the peak of his career. The early 20th century was good to Niagara Falls, New York. Cheap power and land attracted chemical and manufacturing companies, leading to decade-over-decade growth. By 1960, its population had reached over 100,000—about 80,000 more than it started with in 1900. With all that growth came a need for more services, including a bigger central library. Like so many Northeast U.S. cities hoping to use architecture to announce a strong postwar government and faith in humanity, Niagara Falls called on Paul Rudolph. Rudolph was picked unanimously by the city’s architectural selection committee in November 1968 from a field of five finalists. His career was in full stride, and he had a well-established reputation for complex, monumental designs fueled by his individualistic zeal. Discussions to relocate the city’s library out of a humble turn-of-the-century brick structure started in the 1950s. They picked up under the flamboyant and ambitious Mayor E. Dent Lackey, who oversaw a series of urban renewal projects during his 12 years in office, including a convention center by John Burgee and Philip Johnson. The forms of Rudolph’s Earl W. Brydges library bear a resemblance to his fantastical Lower Manhattan Expressway drawings. (He accepted the commission in 1967 only to see it cancelled in 1971.) In his library, the first two floors are for public use—with a reading room, children’s library, and computers on the first, and an auditorium, meeting room, and administrative offices on the second. Local archives are located on the third floor and mechanical equipment on the fourth. Rudolph relies on angles to create visual depth and variety while instilling a constant sense of drama and tension throughout the exterior. Inside, natural light floods down from its clerestories onto an open, three-floor plan, creating an atmosphere that’s as serious as it is calming. An aerial drawing of the library was displayed alongside other contemporary projects by Rudolph and his peers in a 1970 MoMA exhibit, Works In Progress. Shovels broke ground that same year. But a symbol of progress soon turned into cause for concern. 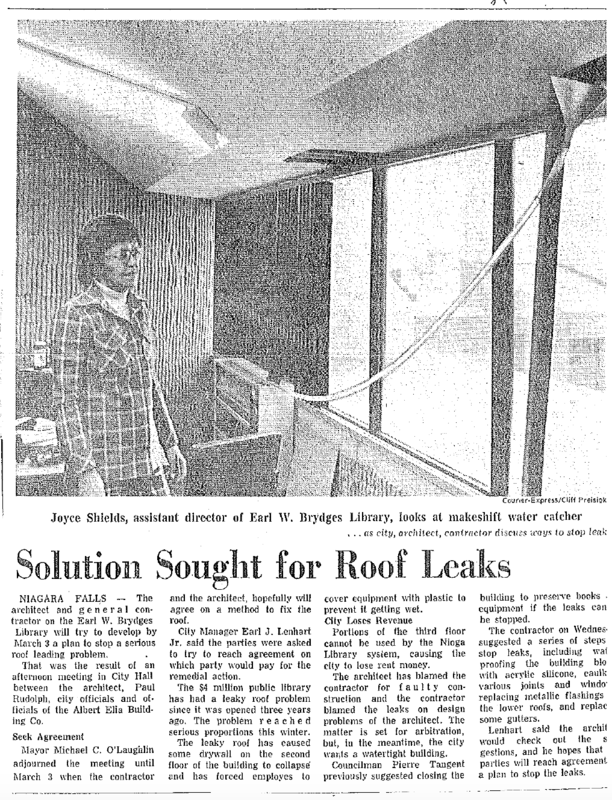 Water leaks were discovered in the unfinished building in 1972. When construction wrapped up a year later, city council initially refused to accept the building from Albert Elia Company, the local contractor on the project. Moisture appeared on the library’s walls and ceiling. Leaks were reported whenever it rained. Elia blamed the architect. Rudolph blamed the contractor. It looks to us as though the city, as well as firing Mr. Rudolph as the mayor suggests, might be in a good position to begin thinking of seeking punitive damages if Mr. Rudolph’s uncooperative behavior continues. “I am completely disgusted,” said mayor Michael O’Laughlin the other day, after Rudolph failed to show at the City Hall meeting. So are we. The new library was the talk of the town for all the wrong reasons. 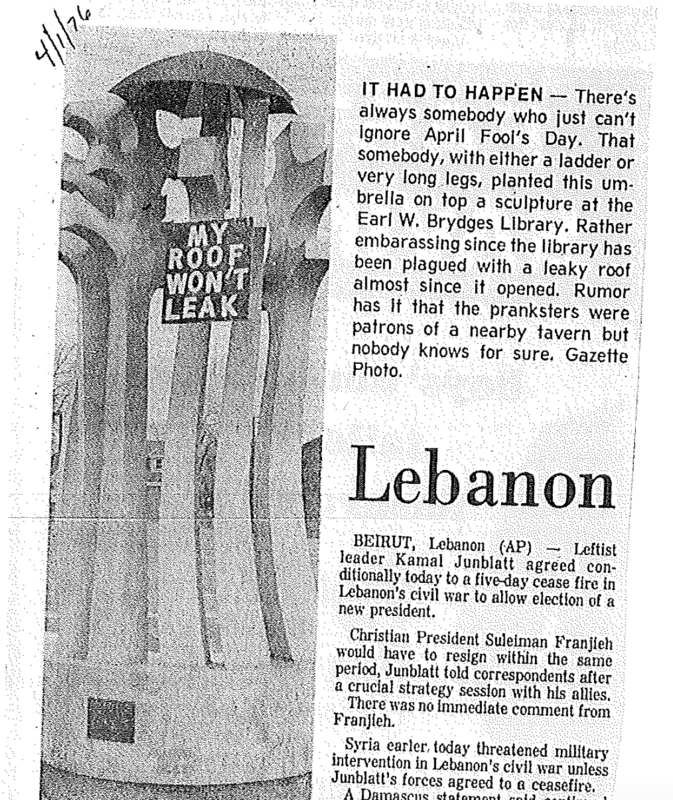 On April Fools Day, 1976, an unknown person placed an umbrella on top of a public art piece in front of the library with a sign that read, “MY ROOF WON’T LEAK.” Earlier that year, the Buffalo Courier-Express photographed a makeshift “water catcher” inside the office of the library’s assistant director. [D]amage to the building and the estimated cost repair at $2.5 million. Hill [the consultant] indicated in its study that Paul Rudolph made at least three errors in plans that caused or contributed to the leakage, and omitted two other design factors that may have added to the problem. According to Hill, Rudolph's errors and omissions included: (1) A roof drainage system too small for the building and in violation of the New York State Plumbing Code, (2) roof flashing designed and installed so low against adjacent walls that it allowed water to overflow it and run into the interior of the building, (3) exterior wall coping designed without any method of preventing water from entering beneath it, (4) exterior building block so porous it readily absorbs large quantities of water, (5) through-wall flashing plans lacking sufficient detail to permit the building's general contractor, the Albert Elia Building Co., to install it properly." "Copies of letters contained in the report indicated Elia requested during construction that the flashing be raised six to eight inches in order to avoid the possibility of an overflow, but Rudolph rejected the request ‘due to aesthetics.’"
The intensely private Rudolph had developed a reputation for fixating on design experimentation while being fairly apathetic to construction details. In fact, neither news reports at the time of the controversy, nor interviews conducted with Niagarans, architecture scholars, or Rudolph advocates for this story suggest he ever visited Niagara Falls during the decade the library kept leaking while his work prospects dried up. The Earl W. Brydges library was officially leak-free, restored, and rededicated in 1982. Niagara Falls finally sued Rudolph and Elia for $6 million each the previous year, and a settlement was reached in 1984, with Rudolph paying $1.12 million while Elia and its subcontractors agreed to pay $1.1 million total. Minus a few loyal clients, the public fallout from this and other lawsuits—as well as the general artistic and cultural shift away from heroic concrete architecture—essentially forced Rudolph to find work in Asia for the rest of his life. Rudolph’s library simply stands out as a weird, enduring force for good in a city without much else going for it. But compared to the demise of Rudolph’s Shoreline Apartments in Buffalo and his Government Center in Goshen, the Earl W. Brydges Library is holding up well. That may change in another decade without political will and dedicated resources. “The floor is sinking. It leans,” says Potter. She adds that historical materials are exposed to too much sunlight in the open space, with windows too large and high for UV filters. “I’d like to see those items and city records out of the building and into a museum or shared archives,” she says. A building survey five years ago determined the library would need $2.1 million in repairs. Potter gets the sense local politicians view the building ambivalently, so it’s uncertain when such funds might become available in a city with no lack of needs. “It’s a city building, but the city doesn’t do repairs,” she adds. Paul Rudolph had ambitious plans for Buffalo's waterfront. Today, proof of it is disappearing. A special thank you to the Niagara Falls Public Library and Tim Rohan for their assistance with this article.